The above info came from Cavery211, and was edited by yours truly (contact me). Professor Saotome discovers a new energetic source, the Getter Rays, coming from space. In order to explore the cosmos, he creates the Getter Robo, a powerful automaton that comes from the union of three shuttles. Suddenly, however, the evil Dinosaur Empire, an underground kingdom of reptiles that for millennia has withdrawn into hibernation and which now claims the right of the surface, returns to light. The Getter Robo is then converted into a combat robot and entrusted to three valiant youngsters: Ryo, Hayato and Musashi. In the final battle, the Dinosaur Empire launches its final attack on the city by launching three robots simultaneously. Apparently, Getter Robo can not fight the last robot, a brontosaurus with heavy weapons, despite having destroyed the other two. Getter Robo is almost destroyed after the battle and so is the laboratory. The only way to destroy the enemy robot is to launch a large missile in its jaws. However, the missile is too bulky to be transported by a single jet so the team has to join the missile in the air and then shoot it, but the operation fails: Musashi fails to complete the union and in the Getter Robo attempt you are destroyed. Musashi, feeling guilty about this, secretly climbs on the Mikiru's jet and in a kamikaze attack, throws himself into the jaws of the monster. The explosive module attached to the shuttle shines in the heart of the enemy base, causing it to explode with all its occupants, eliminating the Dinosaur Empire forever. To the heroes all that remains is to contemplate the sunset and remember the brave friend with the sad notes of Hayato's harmonica. But a new threat stands out on the horizon: a new evil organization intends to control the planet. It is the army of the Empire of the Hundred Demons (Pandemonium Empire in the dub), led by the evil Emperor Burai. When humanity believed it had ended the war, it was wrong: a new conflict is about to begin and the Getter team will have to take the field again for peace and freedom of the human race. Thus begins the second series, Getter Robo G.
Professor Saotome builds a new Getter Robo, more powerful than the first version, able to face the new threat, the Empire of the Hundred Demons, led by Emperor Burai. This new enemy intends to conquer the Earth and proves to be very interested in the technology related to the Getter Rays: during the series, however, the various attempts to steal it are always revealed as failures. Unlike the Dinosaur Empire, the Demon Empire's robots are real mechanical beings, always endowed with horns on their heads and often similar in appearance to the demon Captain who drives them. Ryo and Hayato are thus joined by Benkei, a burly, but courageous, baseball player who takes the place of Musashi at the helm of the third machine. Getter Robo G was dubbed into English by Jim Terry for his show Force Five under the name Starvengers . Since Getter Robo wasn't dubbed, kids were confused on the events of the previous series. 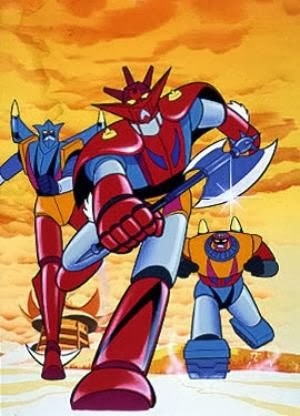 Both series were also shown in Italy under the names Space Robot and Jet Robot . Despite this change of name, the dub still called the titular robots the Getta Robot. The above description came from Cavery211 and Encirobot.com, and was edited by yours truly (contact me).